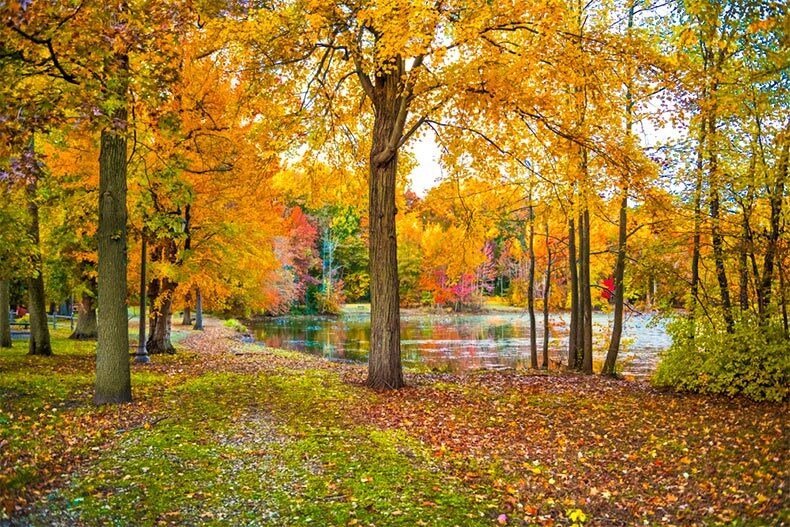 Central New Jersey is full of quaint outdoor spots and affordable 55+ homes. Sometimes, finding the perfect active adult community requires a little give and take. Depending on what your home buying goals are though, you might find that your options seem to be taking more of your hard-earned savings than you would like. If you are seeking an affordable, comfortable home in a very advantageous location, you should consider Central New Jersey for retirement. This prime section of the state allows its residents to easily travel to Philadelphia, New York City, Pennsylvania, and Atlantic City. What’s more, Central Jersey has miles of beaches, mountain ranges, and the Pine Barrens. There are major metropolitan cities, charming suburbs, and more rural areas towards the western portion this region. All of these pluses are reasons why there are over 100 55+ communities here. What will $150K get you in Central Jersey? Take a look at some of these established 55+ communities that come with stimulating lifestyles, amenities, and enough on-and-off site doings to keep you content and happy. Here are some of the most affordable central NJ communities. Clearbrook is in a superb location, being minutes from the NJ Turnpike, 20 minutes from Princeton, and just shy of 30 miles from beach resort towns like Long Branch and Asbury Park. A strip mall just across the street provides daily necessities, and close by attractions like Thompson Park Zoo and Forsgate Country Club offer ample opportunities for indoor and outdoor activities. This well-established 55+ gated neighborhood has over 2,000 resale condo, attached, and single-family homes. There are over 25 floor plans ranging from a 520 square-foot, one-bed, one-bath condo, up to a 1,530 square-foot single-family ranch home with two beds and baths, and attached garages. Some of these homes feature dens, patios, and roomy master suites. A lively clubhouse is Clearbrook’s center for activities, with hobby rooms, a fitness center, and a ballroom. Outdoor pursuits center on a 9-hole community golf course, an outdoor amphitheater, a pool, nature trails, pickleball, and tennis. There are clubs for every interest imaginable, like jewelry making, golf, religious organizations, and dance. A suburb of Princeton, Lawrence puts Carriage Park residents less than 10 miles away from this historic town. Crossing over into Pennsylvania is also easy, with two bridge crossings at U.S. 1 and Interstate 295 within close proximity. This intimate 55+ neighborhood has 210 resale condos. It's practically surrounded by parks, nature preserves and county clubs, including Drexel Woods Park, Mercer County Park, Loveless Nature Preserve, and the elegant Cobblestone Creek Country Club. Running errands is a piece of cake, with the Premier Plaza shopping center, grocery stores, restaurants, and other shops all just minutes away. These condos are sized just right for downsizing, ranging from 723 to 1,540 square feet. They're offered as studios or with one or two bedrooms and bathrooms. Some feature impressive upgrades like granite counters and private balconies. The Carriage Club clubhouse offers a modern exercise facility, activity rooms, and a library. Outdoors, residents gather at the outdoor pool and sports courts, or stroll and bike down the trails that wind through the community. Covered Bridge is a commuter’s dream, with an NJTransit bus station in town at NJTransit’s Manalapan Towne Pointe Park & Ride station. This active adult community is situated about 25 miles west of the New Jersey coastline, so driving to seaside resorts like Monmouth Beach is quick and easy. Covered Bridge Road leads right onto Route 9, a bustling thoroughfare that is dotted with restaurants, shops, movie theaters, banks, and all the other necessities of life. With 1,557 resale attached and condo homes, Covered Bridge is a large community with two clubhouses. The majority of these homes are condos built into two-story condominium buildings. These models are sized at 978 or 1,130 square feet with one or two bedrooms and bathrooms, and assigned parking spots. There are also some one-story, attached townhomes, which are 1,143 square feet with two bedrooms and bathrooms, and parking spots. One of this community’s best perks is discounted membership rates to Pine Brook Golf Course, which is right next door. Covered Bridge’s two clubhouses feature multi-purpose rooms, exercise rooms, a sauna, a performance theater, and a ballroom. The warmer months draw homeowners out to the outdoor pool, horseshoe pits, gardening plots, and tennis courts. And if all that weren’t enough, there are over 40 clubs, including a singles’ group, bowling, singing, writing, and crafts. Friends and neighbors also participate in special events, like fundraisers, holiday parties, flea markets, and bus trips. The Club at East Brunswick has 368 resale condo and attached homes. The condo homes are housed in the property’s two-story condominium buildings. The three models range from 1,125 to 1,032 square feet with one or two bedrooms and bathrooms. The attached ranch-style villas range from 1,074 to 1,228 square feet with two bedrooms and bathrooms, and detached one-car garages. There is a private clubhouse with its own exercise room, game rooms, and billiards. There is also an outdoor pool, a greenhouse and garden area, plus tennis, bocce, and shuffleboard courts for the homeowners to enjoy. Groups also get together to play cards, take day trips, and play golf. East Brunswick is a busy metropolitan area where active adults can thrive. Also excellent for commuting, it is close to the NJ Turnpike and Routes 1 and 18, yet a short drive to outdoor recreation areas like Frost Woods Park, Heavenly Woods Park, and the stunning Tamarack Golf Course. Downtown New Brunswick is nearby, and has some of the best hospitals in the state, including Saint Peter’s Hospital and Robert Wood Johnson University Hospital.